I don’t have all the answers. But there is one thing I’m sure of. If we can learn to tap into our intuition; our higher selves, we are connecting with a power greater than ourselves. When we do this I believe that we are able to receive and channel a creative healing power that is our spiritual inheritance. I would like to share with you my experience of how I learned to connect to the power within through my painting, and how I’ve used my creativity not only as a tool to navigate my way through the difficulties of life, but also to develop my spirituality. I believe that whatever we do, we all have the ability to tap into this creative energy, which is our divine life force. For me it comes through the strongest when I engage in the activity of painting. For me it started in my art school days. I thought it would be so fabulous and for the first year it seemed to offer all that I was hoping for. But soon the ground shifted and things got really tough for a while. Instead of it being a Utopia where I could learn to paint and express myself, there was a backdrop of in-house politics and very soon my college life had become a bit of a battle ground. Not only that, but many of the teachers had become a bit hostile. Often I’d come home to my mum in tears. Instead of the beauty of life, I found myself painting pictures that were about nightmares and the struggle for survival. She always told me that we do the toughest parts on our own. The only way out was ‘through’. And she was right. I knuckled down and went right into the core of myself to unearth the real me, the authentic self. My work began to change from an external point of view to an internal discovery (and recovery) of the self. I started to become more involved mentally, emotionally, and physically. I became the lead actor in my own creations. My painting wasn’t just something I did, it was who I was. It would lead me to search for and discover my own inner light; the light that I would then learn to share with others through my painting and teaching. In art school I started to create a body of work that came from a place of vulnerability and innocence. Like the caterpillar, I went into my chrysalis and emerged to become a much stronger person. My work reflected the inner turmoil that I was going through, that made me want to hide away in my shell. When we go within we are compelled to search for the means to gather strength in order to overcome our fears and difficulties. This can lead to finding that part of ourselves which is indestructible, our soul. The Cage of our outer shell is left behind like the chrysalis of the caterpillar when she becomes a butterfly. For my graduate show, I depicted this by creating an installation, which was a figure made with chicken wire and paper maché tied to a wooden frame. With the help of a colleague, we made a sequence of photographs of the making of this shell and the struggle to break through it to free myself from it, and move into the light. It symbolised liberation, transformation, and the birthing into a new life. In her book, “Finding Your Own North Star”, Life coach, Martha Beck says that when the butterfly is emerging from the chrysalis, she does so bit by bit. This struggle to come out of the chrysalis determines the length and quality of her life. If we were to try and help her to break free of the chrysalis, she would die. Much like life, I believe that our struggle is a part of forming our character which leads to us becoming our authentic selves. This is certainly true when I am painting. I go through a lot of failures and make a lot of mistakes before I can develop a new technique. The Painting “Breaking Through” brings together all of the ideas of going within the shell and the struggle to break free from it. To birth the self into a new phase of life. 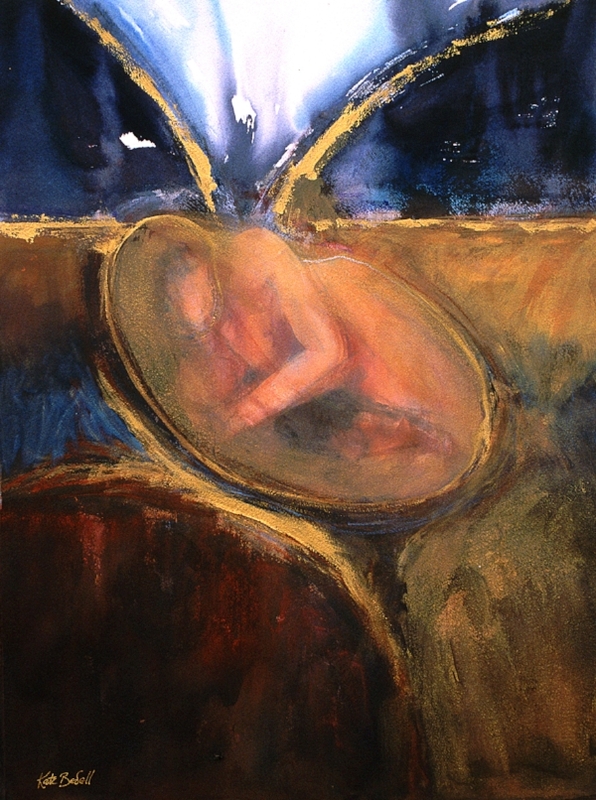 In this painting, “the shell” is now the seed which is buried in the dark earth. It is awakened by the light (perhaps through a spark of lightening?) It calls to mind the lines by the Sufi poet Rumi. I used a very high key interpretation for the figure moving into the light. The watercolour style is loosely painted, so that the figure appears to be illuminated. It has both earthly and ethereal qualities to it. When I was making this painting I was reminded of cave paintings in which early man (or woman) created drawings of their activities. These drawings remain today and give proof not only of the existence of prehistoric man, but that he engaged in a creative act in his daily life. I believe being creative is a necessary part of being human. Our creativity can take many forms and is not confined to art or creative acts. In the poem by Leonard Nimoy below he says our deepest impression on this world is made when we care or love. My search for the power within has led me to believe not only in an external ‘Godly’ power, but also the internal power of the human spirit. When we can learn to tap into it within ourselves, and shine our own light, we show others how to do the same. It is a channelling of energy which comes through us from a divine source. It is part of our human nature and path of evolution to transmit this healing energy to others in whatever way we can, whether it be through our art and creativity or simply by just being ourselves. Little did I know at the time, but my story of emerging from the chrysalis, and going through the cycles of life would be repeated again and again in my work. The power of creating something, while telling my own story through the painting, connected me to a power greater than myself. It has helped me to get through difficult situations, and transform my very ordinary life, into something amazing which has the power to touch other people’s souls.